China's first unmanned missile boat that recently tested missile launch is on display at the 12th China International Aviation and Aerospace Exhibition (Airshow China) in Zhuhai, South China's Guangdong province. 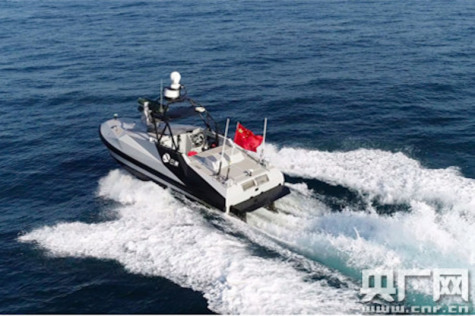 The unmanned boat, Liaowangzhe-2, is the country's first and second globally to fire a missile successfully. A remote-controlled unmanned ship of Israel's "Protector" series successfully fired a missile during an exercise last year. It is for the first time that Liaowangzhe-2 is shown to the public. It is jointly developed by Zhuhai-based shipping developer Oceanalpha, Xi'an Institute of Modern Control Technology and Huazhong Institute of Electro-Optics. The unmanned boat is 7.5 meters long and 2.7 meters wide, having a tonnage of 3.7 tons and a maximum speed of 45 knots. It can sail about 310 nautical miles at a speed of 22 knots. It can be used in sea conditions leveled below rough, or waves below 2.5 meters high. Liaowangzhe-2 is a reconnaissance and strike integrated unmanned vehicle, and it is equipped with a quadruple missile launcher in the front to launch four missiles with a maximum range of 5 kilometers under an image-aided terminal guidance system. It can be used for patrol missions around islands and border waters, attacking medium and small targets on the sea and land. A group of such boats could also carry out disability strike on large targets. The boat has different operation modes, such as fully autonomous, semi-autonomous and remote-controlled.